A near “foolish” attempt to correct Anemia by emergency angioplasty ! This is a true story . . . happened many years ago under my direct vision. A 48 year old women came with significant breathlessness and catchy sub -sternal chest pain . “I was exerting too much in recent days doctor” , she said . Her ECG showed a tachycardia and dramatic ST depression in most leads . The ER in charge promptly texted the cardiologist . The moment he saw the ECG ,he had no hesitation , to order for an emergency angioplasty ( How can he plan a angioplasty , without even knowing the coroanry anatomy . some one murmured . May be . . what he probably meant was emergency angiogram the other explained ) Further , he was telling his fellows . . . that this is going top be tough case and a possible left main PCI . An emergency angiogram was done . On table it was a huge surprise for every one , it was a a classical text book look alike normal coronary arteries ! 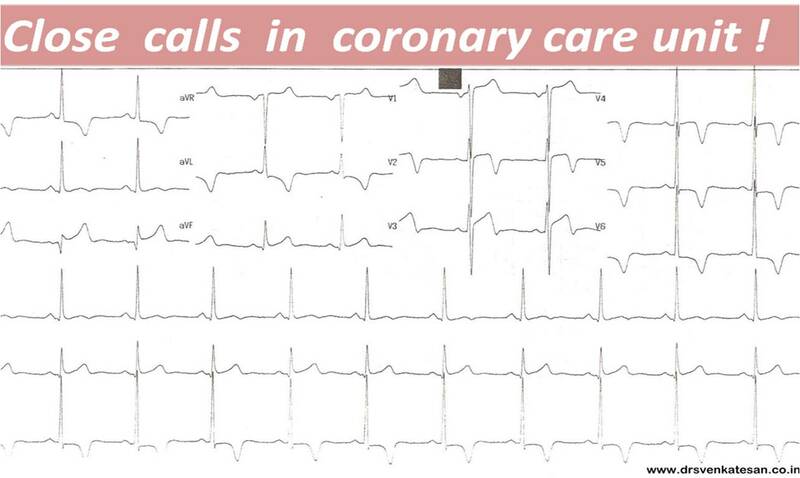 The moment normal CAG was visualized the consultant concealed his momentary surprise and went on to say it is classical case of syndrome X with severe micro- vascular disease causing ECG changes ! As the patient did not give any opportunity to poke her coronaries she was wheeled out of wheeled out of cath lab. Meanwhile , first year fellow came rushing with the blood reports and biochemistry . Is everything alright ? Yeh sir , except her Hb % . . . it is 5.6 Grams ! The bewildered consultant * realized the high coronary drama , that is been enacted over the past 2 hours ! and learnt (and taught) a most important lesson to their fellows ! Hi guys , this is neither a NSTEMI nor a microvascular syndrome X . . . this is simply anemia related extreme ECG changes ! We have erred in our reasoning and our pre cath clinical scrutiny has gone awry ! He went on to say , don’t worry many times medicine is learnt in hard ways . After all nothing adverse has happened here . The women was subsequently investigated and handed over to gynecologist for a probable hysterectomy . Please be reminded , anemia can produce variety of ECG changes. 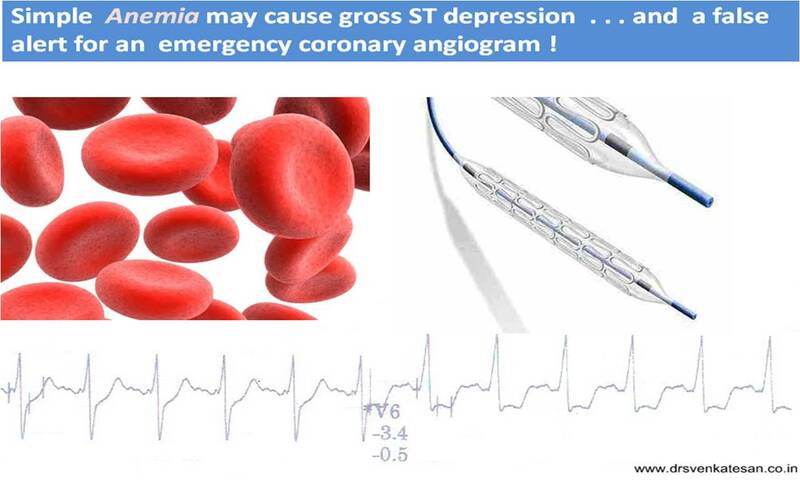 In extreme anemia global ST depression is common especially if tachycardia is associated . The lesson here is , whenever gross ST depression is witnessed with vague chest pain check the hemoglobin first . This is an unusual story of a women , with simple anemia (due to chronic mennorhagia ) landed in cath table in an acute fashion . Luckily she did not have any incidental coronary lesions that prevented her becoming a greater cath lab victim ! * The bewildered consultant is none other than the author of this blog. Traffic jams and TIMI blood flows in national highways ! Acute STEMI is the numero uno of all medical emergencies. Hundreds of life are lost every few hours in our planet.Significant chunk of them do not even reach the hospital alive . While the emergency crew has many vital responsibilities , the cardiologist job starts only after the patient reaches the hospital . Hence the ambulance crew need to act much more sharper. Please remember even the skills of the driver will have a direct impact on the myocyte survival. The symptom to first medical ( or second hospital ) contact could be as vital as a primary PCI procedure itself . A 3 minute traffic jam can kill 3 thousand myocytes ! One could imagine the importance of decision making process here. Distance from the point of contact to PCI lab , the anticipated delay , intensity of traffic matters . Is it not funny , to realise when we have a reperfusing agent on hand , within the ambulance and the vehicle stuck in the traffic jam waiting to reach a reperfusion room situated 50 km down the high way ! 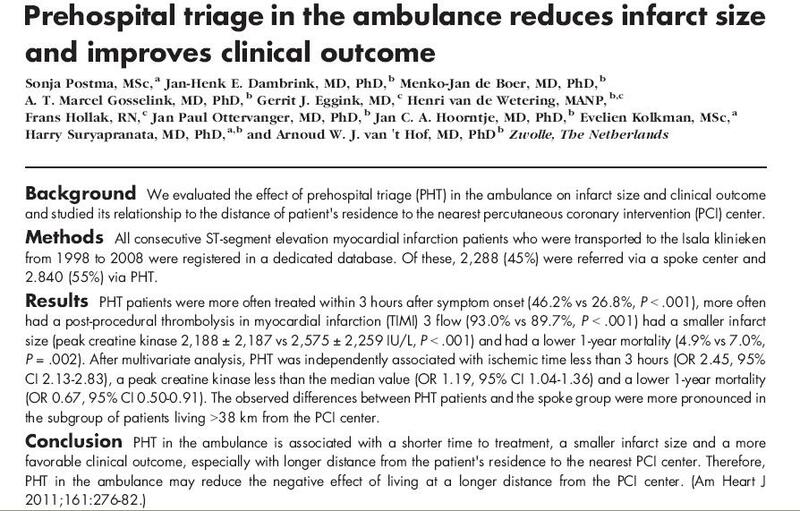 When we realise , even in a well developed country like Netherlands , time to shift to cath lab is a big issue (Read the following article ) we will never ever know , how much of myocardium is consumed by traffic jams in a country like India , where the traffic scenarios can be more chaotic than a VF ! It begins with chest pain recognition. Meanwhile spontaneous thrombolysis will begin in most of them ! A promptly administered Aspirin and clopidogrel a shot of heparin and a lytic agent within 30 minutes is distinctly possible and may be more effective at a fraction of cost. 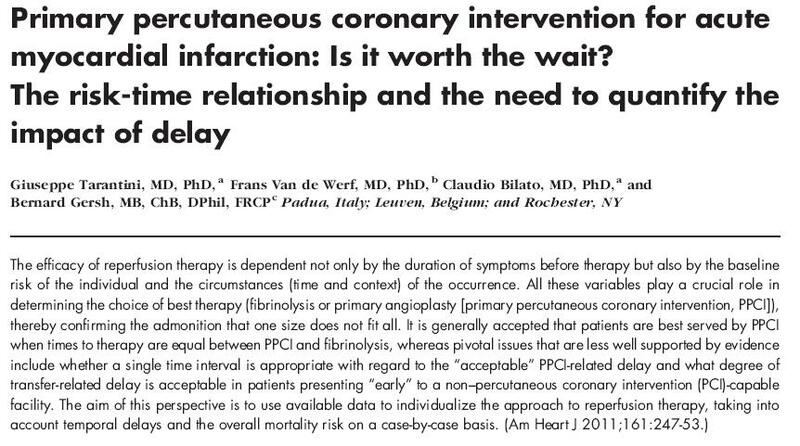 Even though current studies still . . .do not favor primary PCI over thrombolyiss in the first hour , most of the cardiologist do show some favoritism towards pPCI for some unknown reasons. So by default , many of the ill fated STEMI patients enter an unrealistic hemodynamic race in the deadly highways and urban lanes our country ! For every minute that goes by , the patient not only loses his muscle but also the golden opportunity to get salvaged by the thrombolytic agents . Here , we need to know TIMI 2 flow achieved easily by thrombolytic agents is quiet effective in preventing myocyte death. Helicopter drop over cath lab -( Distant dream ? or better to be in dreams ) It has been noticed even a helicopter was squarely beaten by the thrombolysis in terms of early and timely reperfusion. Worse still . . . some of these patients are made unsuitable for thrombolysis as well ! Management of STEMI is gradually becoming a team effort. The emergency crew , the command , the destination hospital all need to be alert and proactive. When the initial anticipated delay is getting prolonged , get the ground staff in cath lab ready for an emergency landing . A word of advice for the ambulance crew .Involve them more in the decision making as they are in a better position to calculate the possible delay. If delays are anticipated propose a thrombolytic order and get clearance from the command and administer the lytic agent as early as possible. It is highly likely , restoration of TIMI 2 flow right in the middle of national highways is much . . . better than a TIMI 3 flow that is going to come later . . .in a distant cath lab . Finally use the common sense liberally before you act . . . unfortunately it has become the most elusive sense for man kind ! NSTEMI is a common clinical problems in CCU. By default most of us think , if it is NSTEMI . . . there must be ST depression. This thinking is not logical but traditional. Still, ST depression may be the common presentation. NSTEMI with ST depression has much worse outcome than other forms. The following ECG is from a 45 year old man with a vague mid sternal chest pain for 48 hours. His echo showed wall motion defect in LCX territory .A diagnosis of NSTEMI was made.The predominant finding was biphasic T waves . **One may wonder why can’t we call this ECG as a Classical STEMI ? There is a 2mm ST elevation , with a infarct as well ? 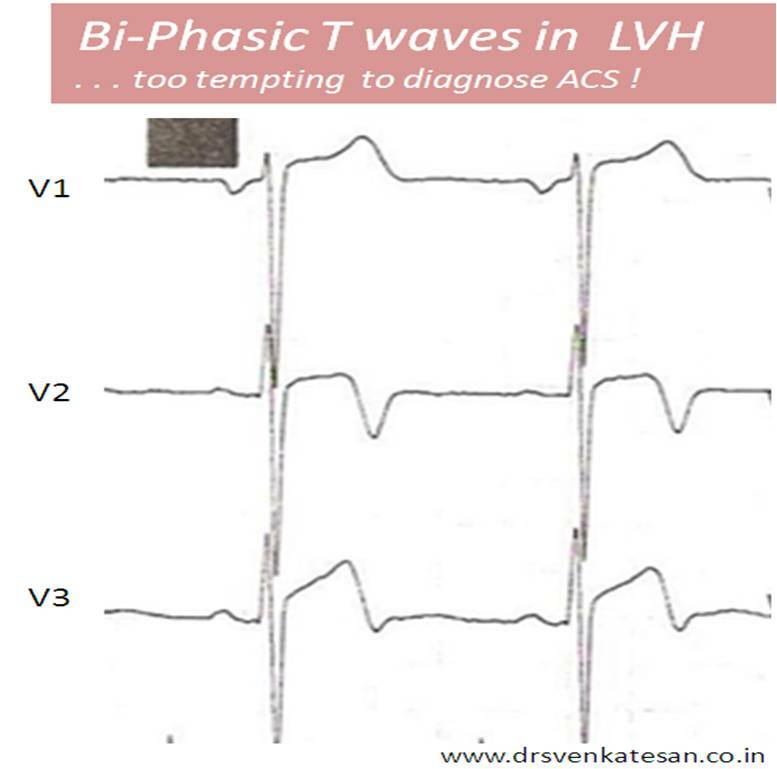 But , the point here is there is no business for T waves to get bi-phasic or inverted in the early hours of a classical STEMI . Read the related article in my site Is the terminology of Non Q MI still relevant or obsolete ?